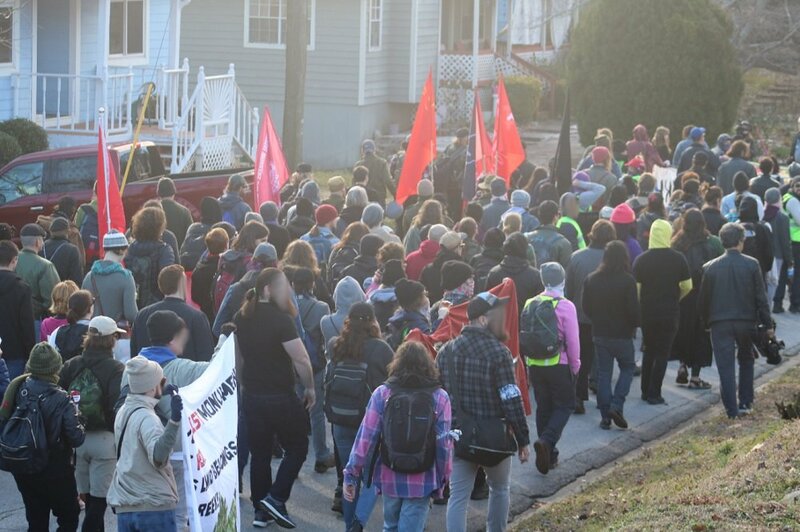 Antifascists march in Stone Mountain to celebrate KKK retreat. The Ku Klux Klan and their white supremacist allies melted away like snowflakes from their plan to hold a “Rock Stone Mountain” rally in support of Confederate monuments on Feb. 2, due to “infighting and fear for their personal safety,” according to the Atlanta Constitution. YDSA and DSA members from Metro Atlanta and other Southern chapters joined a large crowd in Stone Mountain Feb. 2 to demonstrate our opposition to racism despite the cancellation, under the umbrella of the Frontline Organization Working to End Racism (FLOWER), a broad spectrum of some 40 organizations including communists, socialists, anarchists and liberals (see flowerunited.org). The demonstrators held a victory march through the Stone Mountain community and burned an effigy of a Klansman in front of the park’s visitors’ center while police watched but did not intervene. “Left-wing militia groups guarded the outside in case of ambush. None occurred. No arrests. No violence,” said freelance journalist Ford Fischer. The NAACP and allied groups also held an antiracist rally in Piedmont Park Feb. 2, which some MADSA members attended. Burning a KKK member in effigy. An NAACP-led antiracism rally in Piedmont Park Feb. 2. A Klan rally at Stone Mountain park in 2016 had similarly drawn a much larger crowd of opponents, but that rally was permitted and the racists were confined to a limited area by police. No doubt because of the imminent Super Bowl, the authorities refused to permit the Klan rally this year – and also shut down the park Feb. 2, but only after the white supremacists cancelled, apparently to shut out the antiracist demonstrators.